The carrying case is included in the package so that you can store and transport the item safely. Testing the flash intensity might be a bit tricky. 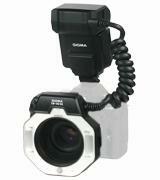 This is an excellent flash for Nikon cameras and macro photography. It will help you create the best ever pics. And a great built quality makes this accessory a no-lose purchase! The sound prompt system will allow you to focus on shooting process without taking breaks. It's an affordable flash ring that can compete even with the similar Canon models. 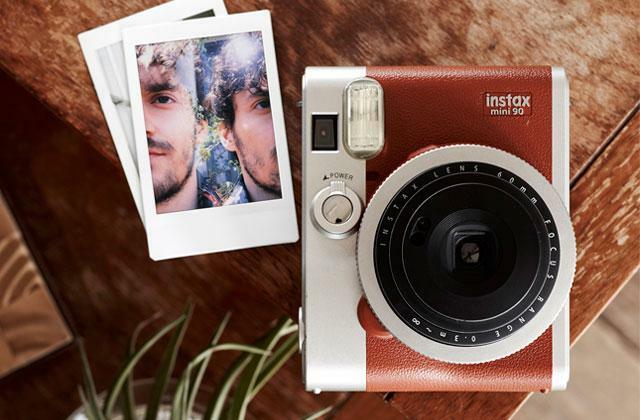 The item boasts a short recycling time, so you can always take a series of stunning pictures. It is a marvelous choice for taking professional-grade macro photography. 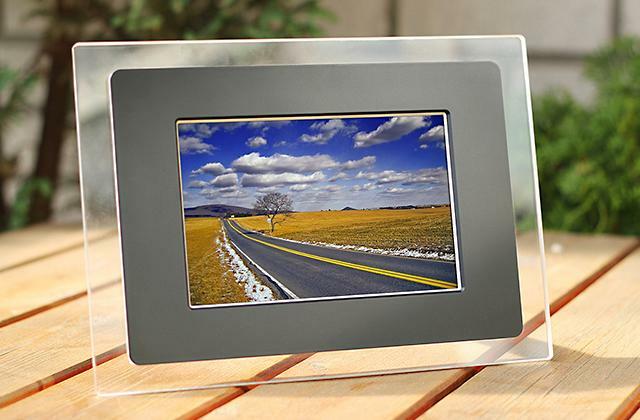 A high-definition LCD display and Dot-Matrix LCD panel allow you to monitor and adjust the settings. The model is pretty bulky. 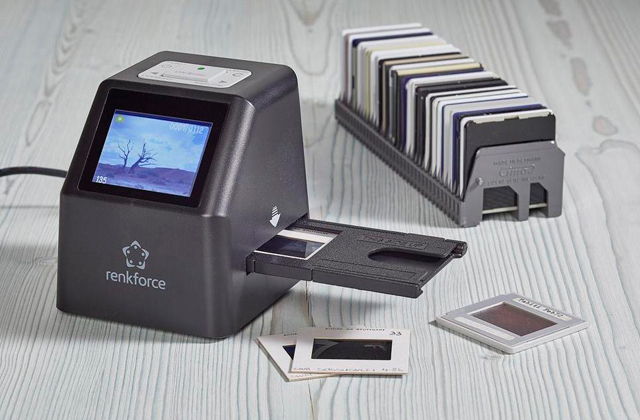 The device boasts a short recycle time(about 3 seconds), so you will capture every single shot. 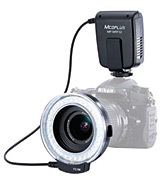 This macro flash light can sync with your PC. It features a compact and ergonomic control panel with intuitive buttons. Even if you use this flash for an extended time, it won't get hot owing to a heat removal system. If used with manual focus lenses, it might be a bit inaccurate. 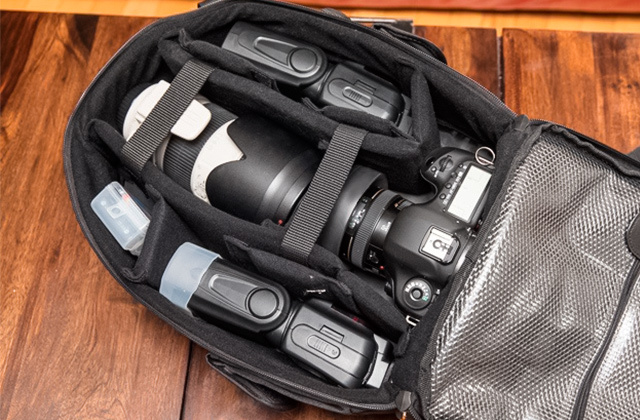 If you want to have a reliable yet affordable flash, consider the MRF32 model. It guarantees excellent results and can be used for macrography, personal use as well as for scientific and medical researches. 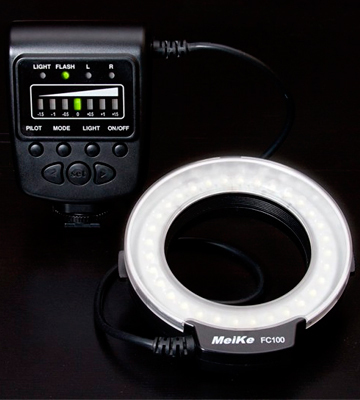 This is a lightweight and convenient LED ring flash that is just the best option for video shooting. The cable from the ring to the control panel is rather long. In case you are planning to keep your own blog or shoot insects nocturnal habits, the Neewer 48 Macro LED flash is a must-have for you. 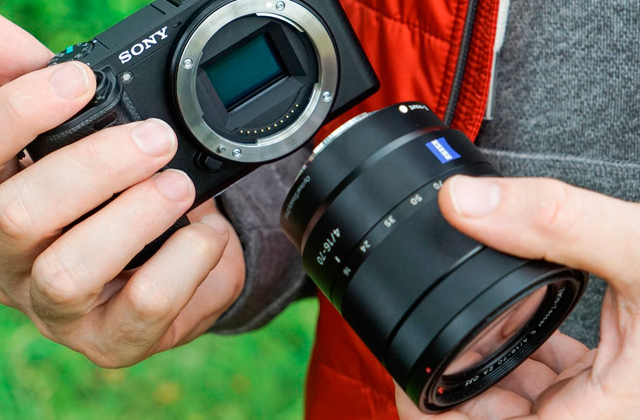 Sigma is a well-known manufacturer of cameras, light filters, lenses, and other accessories for photography. 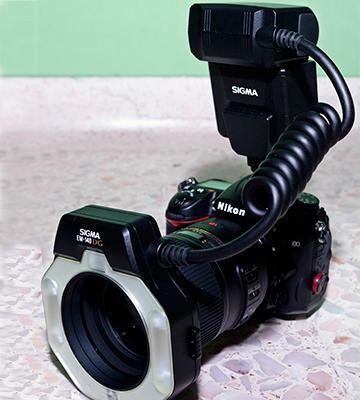 For this review, we have picked the Sigma ring light for Nikon DSLR cameras. This ring consists of 2 separate lamps that can work together or independently. Therefore, you can easily take pictures of the same object in different light conditions in order to get the best results. The Sigma flash for Nikon has one peculiar feature - a high-speed synchro mode. For a more precise focusing, for example in a dark room or at night, the flash has a couple of lamps that you can turn on so that your camera can auto focus quicker. As for the recycling time this flash requires, it's around 4 seconds. Of course, it might take longer for this gadget to get ready for the next photo if batteries are running low. Lots of photographers buy conventional batteries but we recommend using rechargeable ones, since they can be recharged multiple times and save your money this way. There are lots of lenses available on the market and that's why Sigma flash comes with 2 adapters, 55mm and 62mm. That's very important if you use several lenses with your Nikon DSLR camera. 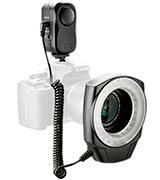 In all, this is a worthy ring flash that will help you take awesome pictures or create breathtaking close-ups. For more than 10 years, the Yongnuo company has been producing such important electronic gadgets as TTL cables, remote controls, battery sets, and so on. However, the company is known mostly for its camera flashes and we have picked one of its best models for this shortlist. 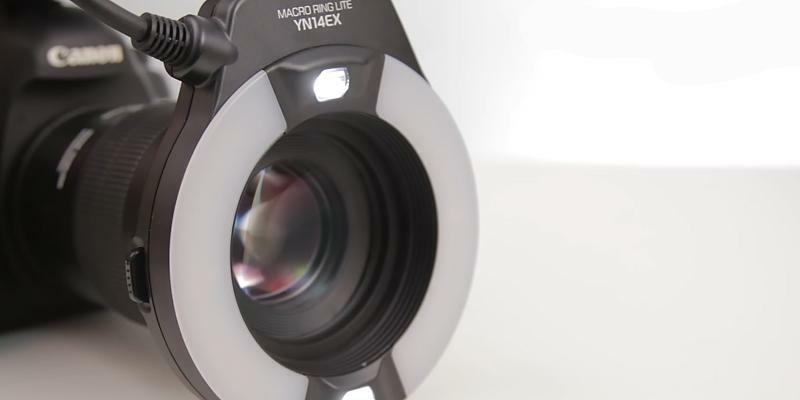 The YN-14EX is a handy macro photography flash for Canon cameras. It has 2 lamps (right and left) and 2 LED focus assist lights (upper and lower). 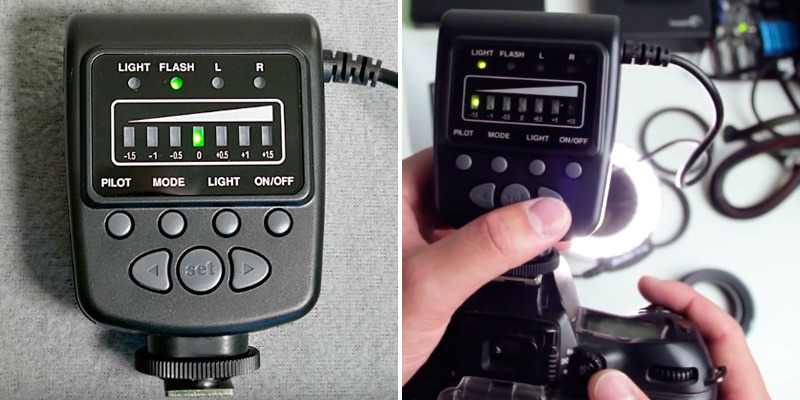 These lights are very helpful for a quick focusing of your camera in low light conditions; just push the respective button on the control panel. Needless to mention, the 2 lamps of this accessory can work separately and you can easily adjust the light intensity for taking the most beautiful close-up pictures in your life! Moreover, you can adjust not just the intensity but exposure as well. This ring is created to help you fully immerse in taking photos without a need of looking at the control panel - just enable a sound prompt system. If you wish to save the battery charge, you can turn the system off! But this is not the only advantage of this model. It boasts a really short recycling time - just around 3 seconds, whereas the maximum time is no more than 4-5 seconds. 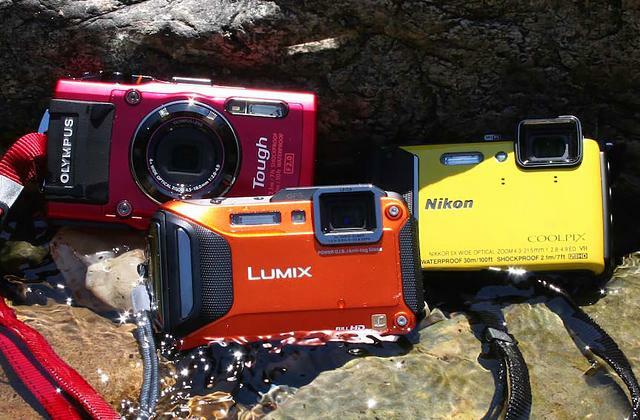 The flash requires 4 batteries - either conventional or rechargeable ones. 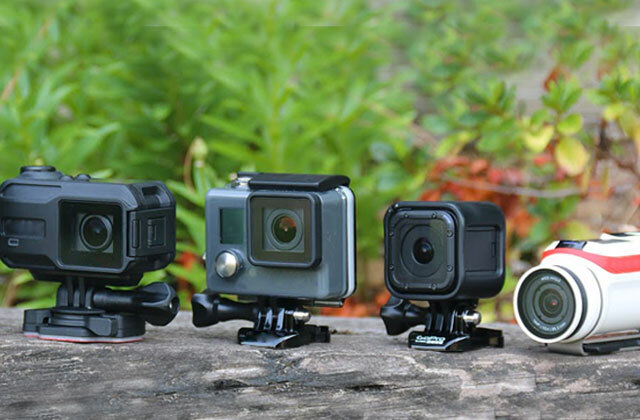 The manufacturer has done its best to make this accessory as multifunctional as possible by including 4 different adapters (52mm, 58mm, 67mm, 72mm) in the package. Thus, you can unpack this ring flash and start taking pictures right out-of-the-box! If you don't wish to overpay for branded models, choose this one and you will be able to take top-grade photo shoots. If you are looking for a reliable and high-quality ring flash for your Canon camera, you should definitely consider the Macro Flash Light by K&F Concept. 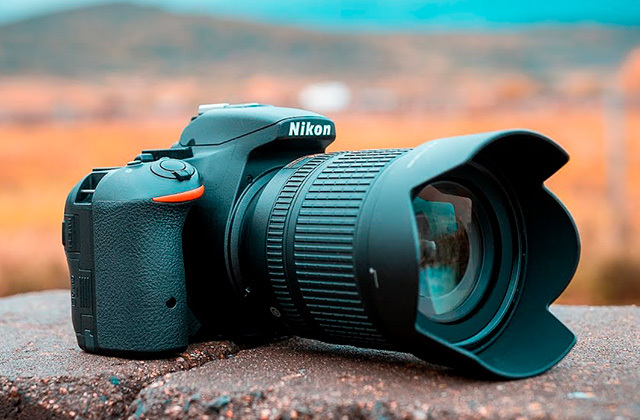 It is compatible with most Canon models and can help you make excellent close-up photos, as every single detail here works to ensure perfect lighting. 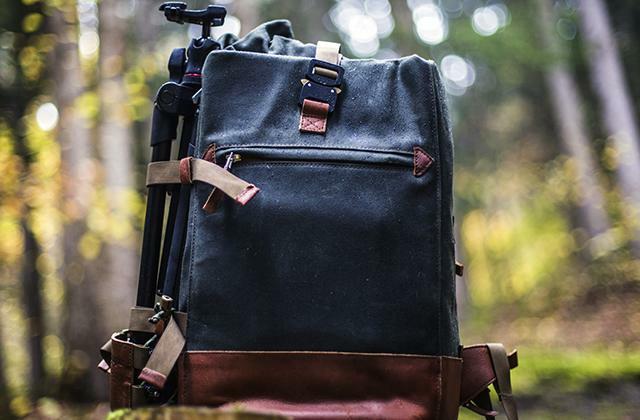 The flash is supplied with a carrying bag for comfortable transportation and storing. What's also important, the flash ring offers a set of adapters for 52mm, 58 mm, 67 mm, and 77mm lenses, so you won't be limited to one photography genre anymore. With a particular focus on shooting in low-lit conditions, the ring is equipped with 2 separate flash tubes with individual controls and 2 focus lights that let you highlight the subject from any angle you need. The ring works in 3 modes - Auto, Manual, and Multi flash. The Multi flash mode or stroboscopic flash becomes of great necessity when it comes to shooting a moving object. This mode enables the ring to fire several flashes within a short period of time and capture movement on a photo! This ring light has an overheat protection to ensure the long-lasting use and low energy consumption. So, this model is definitely worth purchasing, as it can be used for both macro photography and other types of photo shooting. 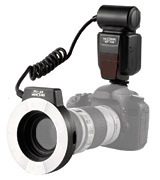 The MRF32 flash ring is a pretty versatile model that works with both Nikon and Canon cameras. Better yet, it fits various types of lenses, as it comes fitted with 7 adapters (52mm, 55mm, 58mm, 62mm, 67mm, 72mm, and 77 mm). The MRF32 flash offers 4 working modes - light, flash, L and R modes (only left or right part of the ring). Agree, it is pretty handy to have the ability to choose between full and partial illumination, as different objects in various lighting conditions require specific illumination. As for the design, the ring consists of 32 LEDs that produce an average colour temperature of 5500k. Additionally, the flash features adjustable power levels giving a user more flexible controls and precise brightness output. Thus, you can achieve more vivid visual effects on close-up photos no matter how low the lighting is. 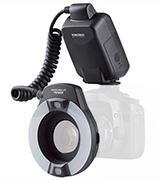 Owing to pretty straightforward and intuitive controls, it won't be a problem for photographers to tune this round flash. Besides push buttons for adjusting brightness and shifting between modes, the control panel has a special button for testing the flash. When you press the Pilot button, all the LEDs flash on, and when you release it, the LEDs go down. 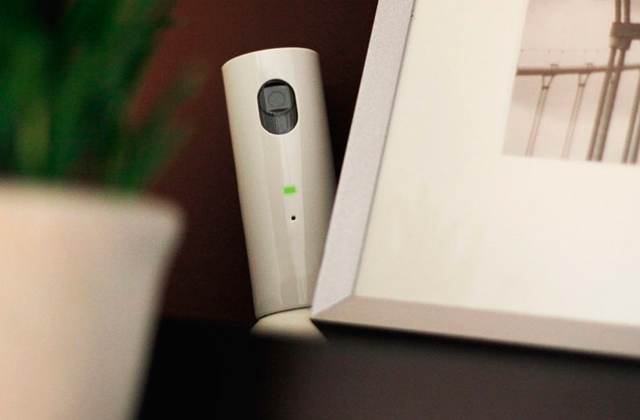 Neewer is a young company that has been on the market since 2010. 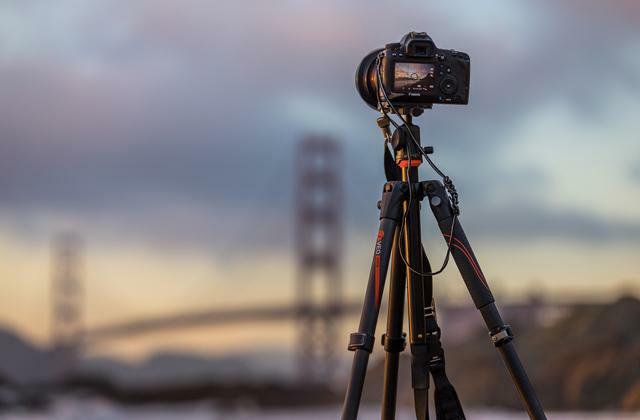 The manufacturer produces a variety of accessories for cameras such as tripods, flashes, remote controls, and lots of others. 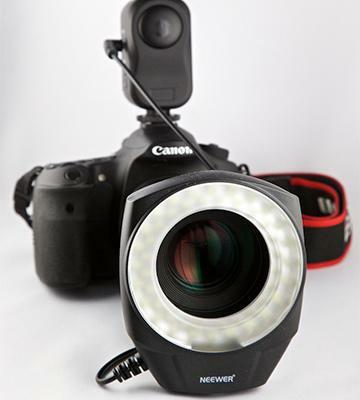 We have picked the Neewer 48 Macro LED ring light model. 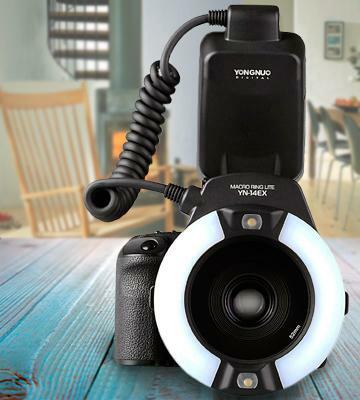 Unlike ring flashes, it's a ring light, meaning it's an excellent accessory for taking pictures or shooting videos of insects or plants. The number '48' in the name of this photo accessory means the number of LED pieces placed all around the light ring. The unit operates on 2 AA batteries that you can buy in nearly any mall. 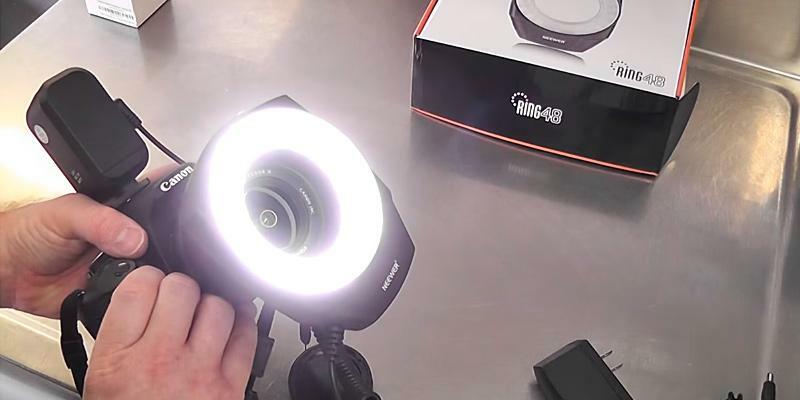 If you need to record a long video (for example, for your video blog), this ring light can be connected to the AC power network. Just like with ring flashes, you can use either left or right part of the light or use them both. Therefore, the Neewer 48 ring light is helpful for photo sets when a photographer wishes to add a bit of shade. The item comes with 6 adapters: 49mm, 52mm, 55mm, 58mm, 62mm, and 67 mm. This photo accessory is pretty lightweight - just 200 grams, so you will feel no discomfort after attaching it to your camera. Macro photography has been quite popular for years not without a reason. Close-up pictures of insects and flowers bring out the details that are not visible to the naked eye. Though, this kind of photographies requires usage of the specific lens and correct lighting. Macro lenses can focus only at a very close distance to the object and, as the result, they can cast a shadow. A normal flashgun cannot solve this problem as it produces off-axis light making your close-up photos overexposed or underexposed. Fortunately, you can shoot shadowless and beautiful close-ups using a ring flash that emits light through a large ring mounted around the lens of your camera. It produces diffused light that comes from all directions and angles around the object you shoot and creates well-lit pics without dark areas and camera’s shadow. The ring flashes are the best lighting sets for macro photography! 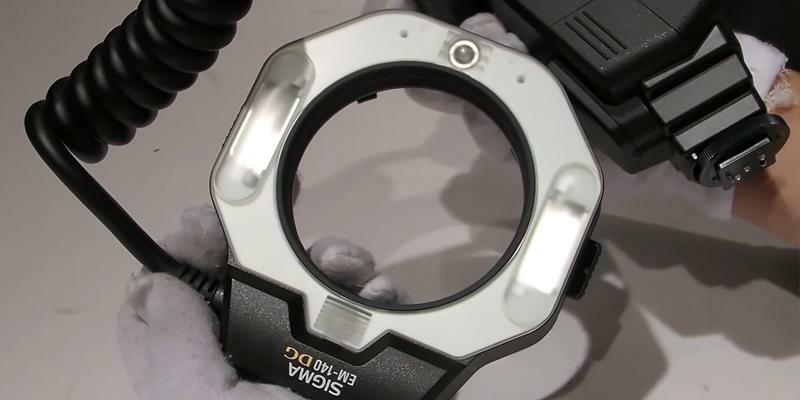 Moreover, some flashes can even work as ring lights for shooting videos. This type of flash should be mounted right on the lens, while a control panel is installed into a so-called 'hot shoe' of a camera. The ring flashlights can be equipped with flashtubes and LED lights. 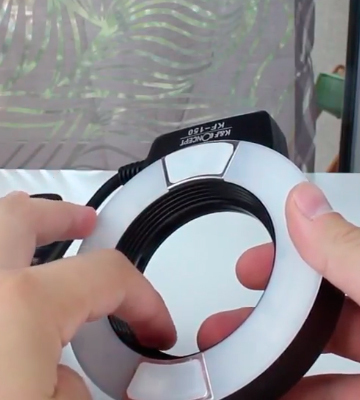 If you wish to take portrait photos, make sure to check our review of the best ring lights. If you are interested in macro photography, you need to use an appropriate lens. 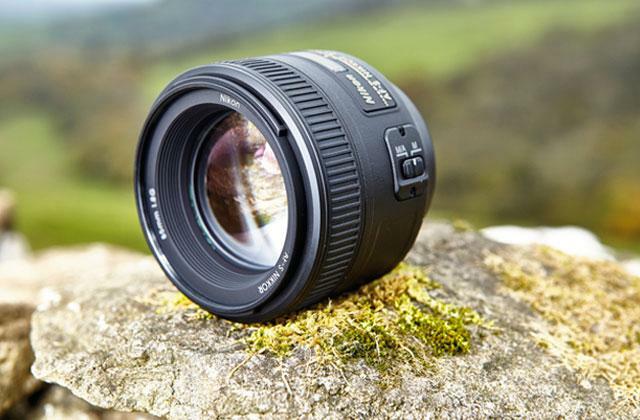 Therefore, look through the shortlist of the best macro lenses for Nikon as well. 1. How to Choose a Flash for Your DSLR, eBay. 2. Bjorn Petersen A Guide to On-Camera Flash, B&H. November 2015. 3. Dave Johnson Flash and Lighting Tips From the Pros, PC Advisor. 26 May 12. 4. Ring Flashes, Michigan Tech. 5. Hazel Rigby 3 Creative Ways to Use a Ring for Portrait Photography, PictureCorrect.